Are you looking for Pit Bull pictures? In this section you will find a small sampling of many different pictures of Pit Bulls who are members of the American Pit Bull Registry ( APBR ) including Family and Children Pit Bull Pictures, Blue Pit Bulls, Red Pit Bulls, Pit Bull puppies, Brindle Pit Bulls, Merle Pit Bulls, Black Pit Bulls, Chocolate Pit Bulls, White Pit Bulls, Moo Moo Patterned Pits and all shades of brown. On top of this you may enter our growing LIVE Member Gallery with en numerous Pits and more being added daily. Based on surveys we have taken, the pictures of Pit Bulls that most people want to see are those Pit Bulls that are blue. Blue Pit Bulls are very much in demand and are currently the favorite color overall. Blue is one of the more rare colors in Pit Bulls. Next in line of color preference in Pit Bull pics that people most request is that of Red Pit Bulls. The Red Nose Pit Bull has a unique history and was once near extinction. Before the Red Nose Pit Bull went extinct however a few individuals began to breed this color of Pit more heavily and now the Red Red Nose Pit Bull is one of the most prevalent colors in existence. Although not defined by our survey pictures of Pit Bull puppies are always in high demand. Who could look at Pit Bull Puppy pictures and not have their heart melt? 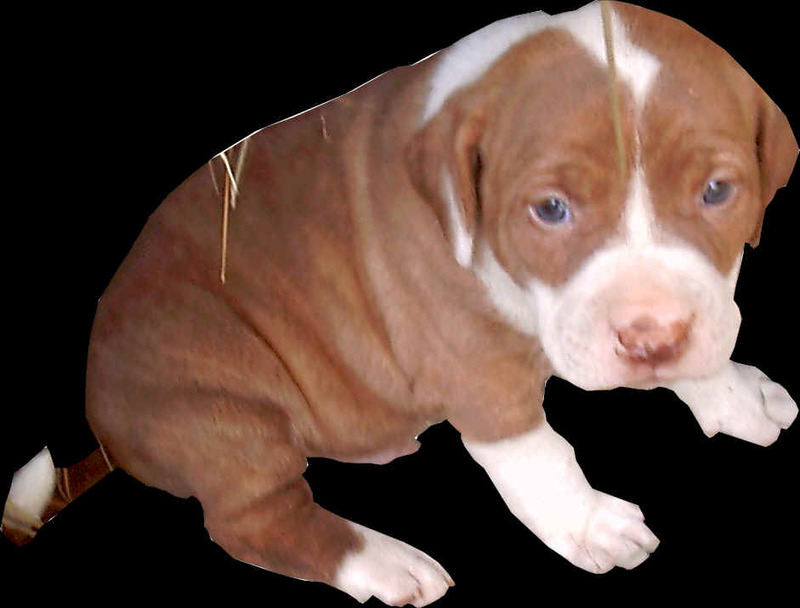 Pit Bull puppies are by far the cutest of all puppy dogs of any breed we think. By far the rarest of Pit Bulls are those that are Merle. The Merle Pit Bull is distinct in its genetics and many times exhibit unique color schemes and a trademark blue eye. The blue eye or eyes are also referred to as crystal and glass eyes. 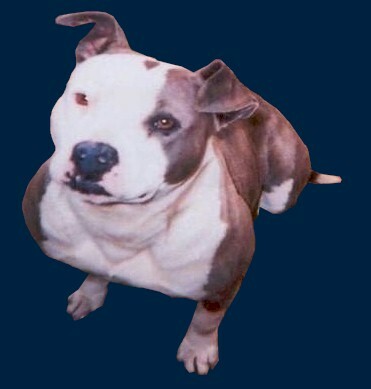 The Merle Pit Bull is the rarest and the demand for this variety is rising quickly. At the American Pit Bull Registry we are lucky to have many Merle Pits registered and are able to provide several pictures of Pit Bulls with Merle genetics. Other Pit Bull pictures we carry are those of brindle, black, chocolate, white, various shades of brown including fawn and buckskin and the ever prevalent but loveable Moo Moo patterns. It is important to understand this is not meant to be a comprehensive or disqualifying list of colors or patterns. Pit Bulls are as diverse as the rainbow and just as beautiful. Many people search the net regularly for Pit Bull dog pictures and end up on our site. Once they see the beauty in the many Pit Bull photos we have their interest in dogs in many cases becomes focused in an interest in the Pit Bull breed. After reading through the breed profile many who thought they would never own a Pit Bull, while searching for dogs of other breeds, change their mind and become owners and enthusiasts of an American Pit Bull Terrier ( APBT ). If you are an owner and have Pictures of Pit Bull dogs you own and would like to have them exhibited we encourage you to become a member of the American Pit Bull Registry (APBR) and we will be happy to provide you the opportunity to also share these. In order to have your pics shown it is necessary to be a member. Pictures should be clear, of good quality, and exhibit your dog in a friendly environment preferably interacting with family members. The Merle is not natural to the pure bred Pit Bull. In the beginning of the registration industry and the registration of Pit Bulls color of eyes and coat were not a consideration for registration purposes. Current trends have many registries now denying membership to those who wish to register their pure bred Merle Pit Bulls. The American Pit Bull Registry has not bowed to the pressure of the industry and still and always will accept the Merle Pit Bull for registration.